China's government and military have targeted US government computers as part of a cyber espionage campaign, a US report on China says. Intrusions were focused on collecting intelligence on US diplomatic, economic and defence sectors which could benefit China's own defence programme, it says. China called the report "groundless", saying it represented "US distrust". A report from state news agency Xinhua cited Sr Col Wang Xinjun, a People's Liberation Army (PLA) researcher, describing the report as "irresponsible and harmful to the mutual trust between the two countries". Both China and the US were victims of cybercrimes and should work together to tackle the problems, the agency quoted him as saying. This is the most explicit US statement so far charging that it is the Chinese government and military that are behind at least some of the many intrusions into US government computer systems. It marks a general toughening of the US position over the course of this year. President Barack Obama raised the cyber-security threat in a telephone call to Chinese President Xi Jinping in March. The issue figured prominently when US Treasury Secretary Jacob Lew visited Beijing a few days later. There have long been fears about China's ability to steal technical and industrial secrets But this latest Pentagon report warns that China's activities go well beyond this "building a picture of US defence networks, logistics and related military capabilities that could be exploited during a crisis." US experts believe that China's "area denial" strategy - its effort to push US naval forces well away from its shores - could have a significant cyber dimension. Of course the United States is also rapidly developing capabilities to counter-cyber attacks and to go on the offensive itself. Indeed this is a field where the boundaries between offence and defence are blurred. US Cyber Command is expanding rapidly. The US and others are thought to be behind a number of computer virus attacks against elements of Iran's nuclear programme; a small glimpse of what the future of warfare may look like. The Pentagon report also criticises a "lack of transparency" in China's military modernisation programme and defence spending. "In 2012, numerous computer systems around the world, including those owned by the US government, continued to be targeted for intrusions, some of which appear to be attributable directly to the Chinese government and military," the report from the US Department of Defense said. The attacks were focused on "exfiltrating information" that "could potentially be used to benefit China's defence industry, high technology industries... and military planners," it said. It added that this was particularly concerning because the "skills required for these intrusions are similar to those necessary to conduct computer network attacks". While China has long been suspected of a role in cyber attacks, the US has generally avoided publicly attributing attacks to the Chinese government, or confirming that US government computers have been targeted. But the issue has come under increased scrutiny in recent months. In February, US cyber security firm Mandiant said that it had linked hundreds of data breaches since 2004 to a Chinese hacking team traced to the site of a military unit in Shanghai. 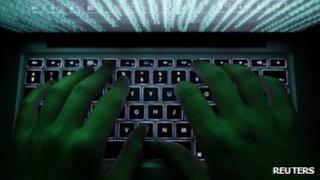 China called the Mandiant report flawed, and said it was opposed to cyber-crime. The report also analyses China's progress in modernising its military and says that a "lack of transparency" about its military capabilities has heightened regional tensions. China announced in March that its annual defence budget was $114bn (£73bn), an increase of 10.4%. However, the Pentagon estimated that China's total military expenditure in 2012 was higher, between $135bn (£83bn) and $215bn (£138bn). China launched its first aircraft carrier in 2012, and is also investing in ballistic missiles, counter-space weapons and military cyberspace systems, the report said. Defense Department official David Helvey said that while none of the individual weapons systems were an issue, the "integration and overlapping nature" of the systems left the department "concerned". They could boost China's ability to restrict access to, and military operations in, the Western Pacific, he said. Mr Helvey said the report also found that China had "increased assertiveness with respect to its maritime territorial claims" over the past year. China has territorial disputes with many of its neighbours, including in both the South China Sea and East China Sea.